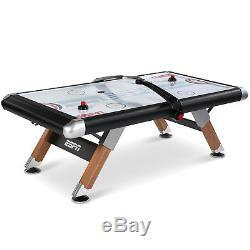 ESPN Belham Collection 8 Ft. Air Powered Hockey Table with Overhead Electronic Scorer and Table Cover, Black. Brand new and factory sealed. 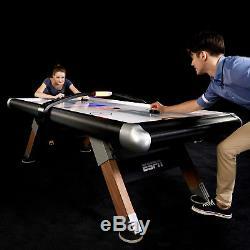 ULTIMATE GAMING FUN This electronic air powered hockey table is perfect for a game room in your home or basement. Enjoy some competition with your friends or family at any event, party or gathering with the ESPN air powered hockey table, creating endless memories with the ones you love. ELECTRONIC SCORING CAPABILITIES This ESPN air powered hockey table includes an electronic overhead score keeper thats across the tabletop, as well as a timer with arcade sound effects to help you keep track of the action and colorful lights provide a genuine arcade experience. 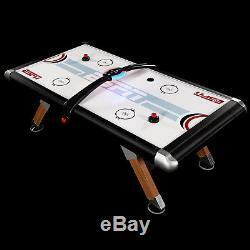 TOP QUALITY EQUIPMENT ESPN professional quality table set has a UL certified motor for an even, cool air flow across the coated playfield, allowing the puck to slide easily and swiftly, creating faster paced games that promise even more fun. STURDY CONSTRUCTION We strive to deliver the best product possible, while offering our customers a tremendous value that is unsurpassed in the market, which is why weve partnered with ESPN. This 8 foot air hockey table has full panel leg supports for additional durability and longevity, as well as oversized 6 inch leg levelers for a perfectly and totally balanced playing surface. ACCESSORIES INCLUDED ESPN 8 ft. Air powered hockey tables come complete with all accessories to have the best arcade game fun, including a unique table cover with the ESPN logo, 4 pucks and 4 pushers for multi-player gaming that is fun for the entire family. 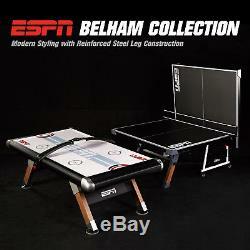 BELHAM COLLECTION ESPN introduces you the Belham Collection with modern styling reinforced steel leg construction. ESPN are designed for players of all skill levels and ages, from kids to adults and designed for fun for the whole family. Visit another item in BELHAM Collection with link below. Full panel leg supports for additional durability and longevity, as well as oversized 6 inch leg levelers for a perfectly balanced playing surface. An electronic overhead score keeper includes timer and arcade sound effects with colorful lights provide a genuine arcade experience. 120V UL certified fan motor for even and consistent air flow. Comes with everything you need for quick assembly and play. 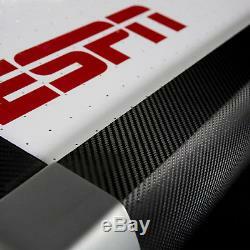 Includes a premium ESPN table cover to protect against scratches and dust build-up, extending the life of your table. 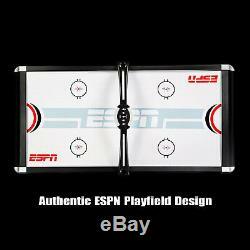 Accessories includes: 4 pushers, 4 pucks and 1 table cover with ESPN logo. Product dimensions: 96 x 48.5 x 32 inch (LWH). Packaging dimensions: 100.75 x 53.75 x 6.875 inch (LWH). This item is brand new in original, unopened box. The item "ESPN Belham Collection 8 Ft.
Air Powered Hockey Table Electronic Scorer & Cover" is in sale since Thursday, September 13, 2018. This item is in the category "Sporting Goods\Indoor Games\Air Hockey". The seller is "shortstopllc" and is located in USA.